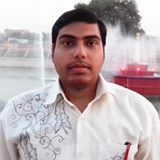 Oracle VM VirtualBox gives the ability to install multi-OS (Operating System) on your single PC without affecting original OS. We can test different platforms application software easily (Such as Windows, Mac OSX, Linux, Ubuntu, Solaris, BSD, IBM etc). But File sharing between your main OS to Oracle VM VirtualBox, It is a bit difficult for new users. We can’t share our files between Host OS to guest OS & from guest OS to Host OS Because by default, this feature is not enabled in VirtualBox. Therefore if we want to share (copy or move) a file (eg. Software, Game, Music, Video, Document) into VirtualBox virtual machine then you can share files with these features: 1- Shared Clipboard, 2- Drag ‘n’ Drop, 3- Shared Folder. 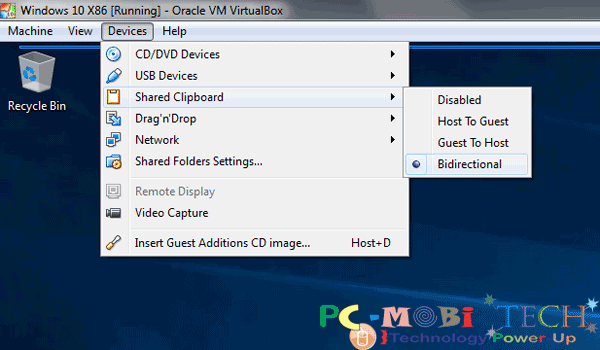 How to share files between the Host OS & Virtual Box Guest OS? Disabled: You can’t use shared clipboard if disabled. Host To Guest: You can cut-copy & share files from main OS into VirtualBox. Guest To Host: Share files from VirtualBox to your main OS. Bidirectional: This feature enables the Bidirectional feature. Host to Guest and from Guest to Host. This feature enables Drag and drops functionality, So you can simply hold & drag your text and drop it in VirtualBox text editor. Disabled: Same as Shared Clipboard feature. When your Operating System gets loaded, Click on Devices Menu & then click on Shared Folder Settings… option. Shared Folders Settings dialog box will appear. Now Click on + folder icon as you are seeing in below screenshot. 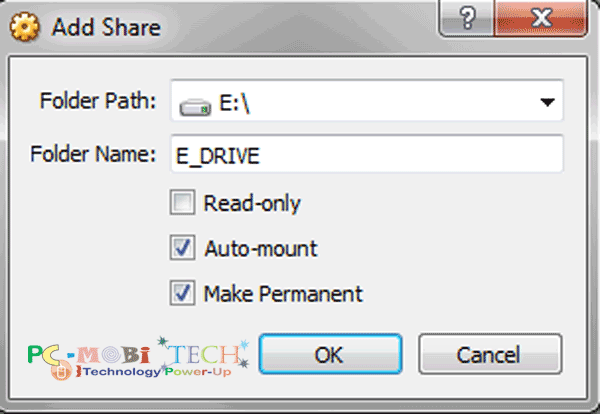 Folder Path: Type your host drive path which drive or folder you want to share in VirtualBox. You can also browse & select your drive or folder path by clicking on the drop-down ∇ icon. Folder Name: Type a name of drive or folder eg. F_drive, Video, Movies etc. Read-only: Use this feature only when you don’t want to enable write permission to the drive or folder and only want to see the folder content. Auto-mount: Tick this checkbox. This will automount your drive & folder when you restart your VirtualBox OS. Make Permanent: Tick this checkbox, this will allow VirtualBox to attach the drive or folder permanent. Click on Devices menu & choose last Insert Guest Additions CD image… option. Now go to explorer window and you will see the Guest Additions ISO is attached to the CD drive. Double Click on the drive & install the software. I hope that this article will be helpful for you. 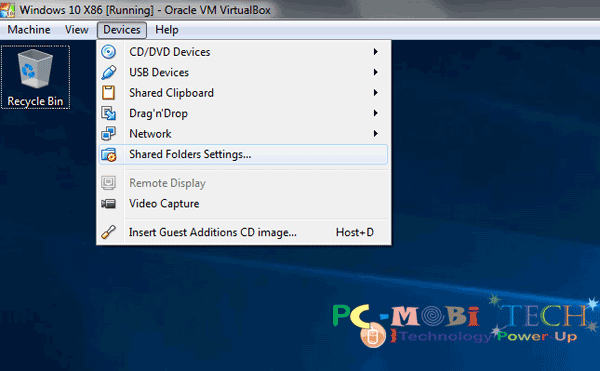 How to record videos with Oracle VM VirtualBox. Virtualbox: Fix the full-screen problem for all OS. 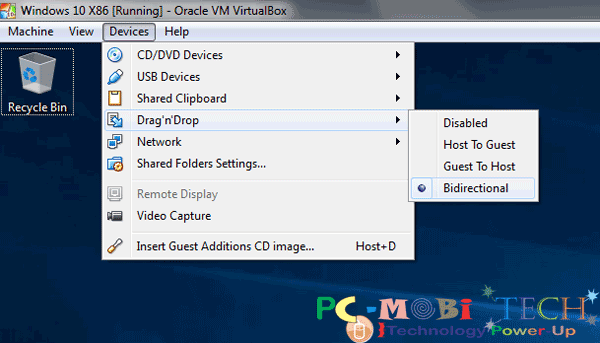 How to Enable-disable internet in VirtualBox.